Home > Products > 1848 Süd-Afrika. Nach Capt. Owen’s Küsten-Aufnahme, der Hebert-Arrowsmith’schen Karte, den Reisen un den Karten v. Burchell, Alexander, Gardner, Drège, Harris, &c., &c., &c.
1848 Süd-Afrika. Nach Capt. Owen’s Küsten-Aufnahme, der Hebert-Arrowsmith’schen Karte, den Reisen un den Karten v. Burchell, Alexander, Gardner, Drège, Harris, &c., &c., &c.
Extends from Walvis Bay [“Walfisch B.”] in present-day Namibia, eastward across the southern part of present-day Botswana to the area south of the Limpopo River. 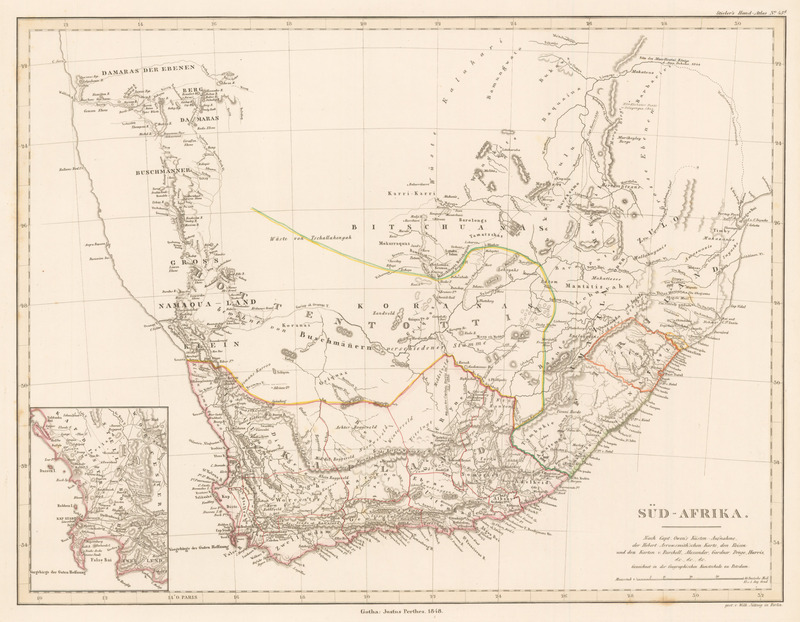 In other words, it covers all of the region of the present-day Republic of South Africa. Large swaths of the northern interior are unexplored. An inset depicts Cape Town and False Bay and immediate surroundings. The Cape of Good Hope is termed “Vorgebirge der Guten hoffnung.” The coast lines on either side of the Cape are highly detailed with names of rivers, ports, points, and cities all faithfully designated. Condition: Good condition with very minor foxing.